"You are awesome. You made us feel special from the moment we walked in the door. I so appreciate your attention to detail & hospitality" Steve. "Thanks again for everything. We really appreciate all you did to make our trip so perfect. We will definitely rent from you again". Lori. Steamboat is actually a complete mountain range: Mount Werner, Sunshine Peak, Storm Peak, Thunderhead Peak and Christie Peak. 2,939 acres (1176 hectares) of permitted terrain offer a diversity of trails for all levels of ability. Gladed areas of Sunshine and Storm Peaks are Steamboat’s particular claim to fame, with “champagne powder” in the trees for the most avid powder hounds. The Morningside Park Expansion opened 179 acres of new terrain at Steamboat. The four-phase Pioneer Ridge Expansion, is a 770-acre area of intermediate and advanced terrain to the north of the existing ski area. 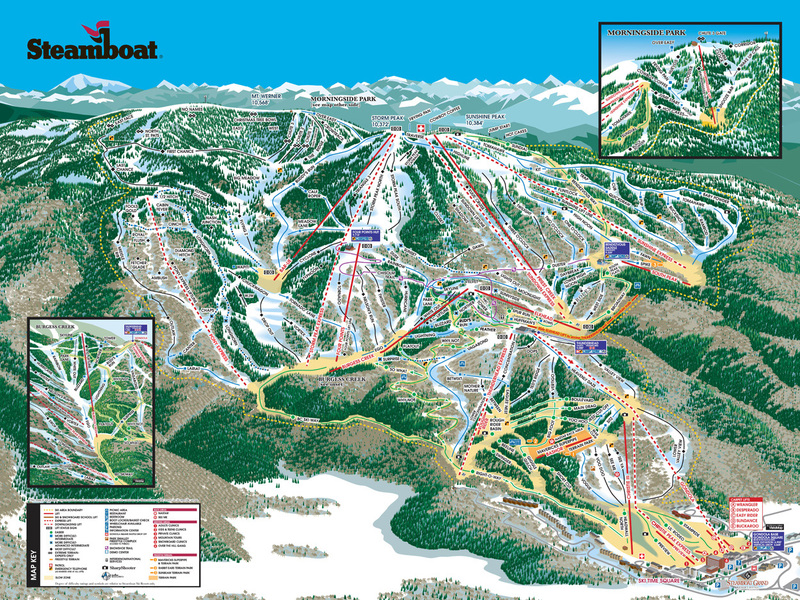 Steamboat Ski Resort offers the remoteness of the Colorado Rockies, but is one of the easiest ski resorts to get to. We have the closest major airport of any major ski resort in Colorado or Utah, with non-stop and connecting flights from points nationwide and internationally. For complete ski vacation for families, couples and individuals, or for a full service convention facility, Steamboat Springs is the destination of choice. When you book your lodging with Condos in Steamboat, it makes you eligible for discount lift tickets. Call Kim in Steamboat for details. 1-800-820-1886. Steamboat’s Kids Ski Free™ program enable children 12 years of age and under to ski free the same number of days as their parents when parents purchase a 5-or-more day adult lift ticket. Steamboat pioneered Kids Ski Free™ in 1982, setting the standard in the industry. Today, it’s still going strong. Steamboat’s Kids Ski Free™ program allow children 12 years of age and under to ski free the same number of days as their parents when parents purchase a 5-or-more day adult lift ticket at regular prices. Voted North America’s #1 family resort, Steamboat offers additional family programs loaded with value for your family vacation! Availability: Kids Ski Free™ is available the entire ski and snowboard season! Proof of Age: Proof of age is required for the Kids Ski Free™ program of all 11 and 12-year-olds, or for children who appear to be that old to the ticket agent. If proof of age is not provided, the parent will be required to purchase teen lift tickets at the respective season rates. If at a later point in time, proof of age is provided (birth certificate, passport, etc. ), a full refund will be made.